Now you can get the Succulent Flavour of "Beer-Can Chicken"
Without using the plastic-lined, painted aluminium beer can! Simply fill “Chickāno” with beer and your favourite herbs. Put more herbs inside chicken. Rub herbs on outside of chicken. 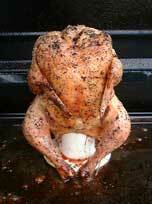 Place chicken on “Chickāno” (in a roasting pan or pie tin), so that it’s sitting upright, with the “Chickāno” sticking up inside the chicken. Save contents of “Chickāno” and roasting pan for great chicken soup. Regulate barbeque temperature to 350 – 400 degrees F.
Toward the end of cooking time, slit the skin linking the thigh and the body of the chicken to let the heat penetrate better.